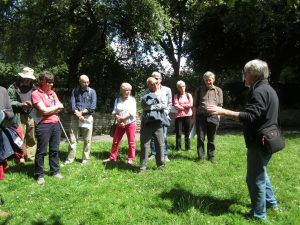 Saturday afternoon was a gloriously sunny day for our walk around Redcliffe with Bob Jones, who had been involved in many sites in the area. We started at St. Mary Redcliffe and were told the church started life as a chapel in the mid 12th Century, but today it has more modern cladding. The spire was struck by lightning in 1446 and was rebuilt by subscriptions in 1871. We walked to a Quaker burial ground, which was originally within the precinct of St. John’s Hospital. 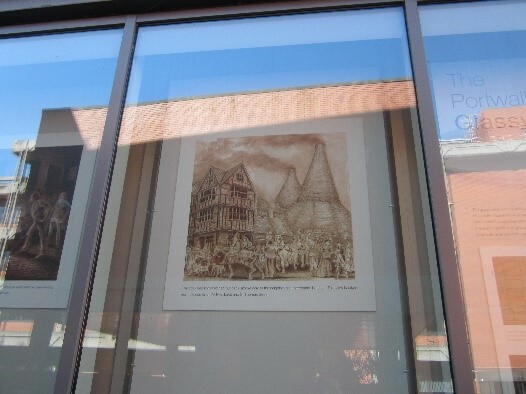 By the 15th Century the hospital had only one brother and it was surrendered at the Dissolution in 1544. This area was known as Red Rock Gardens and used as a Quaker burial place from the 17th -20th Centuries. At the southern end of the gardens is a medieval hermitage which had been in existence from the 14th century. 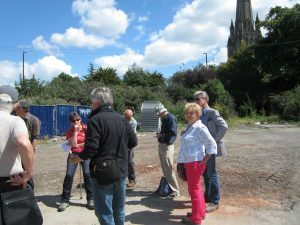 Just behind St. Mary Redcliffe is a ‘building site’ that was considered by English Heritage to be worthy of scheduling for its extremely important archaeological potential, especially regarding the evidence for an early glass works which is likely to have been on this site. 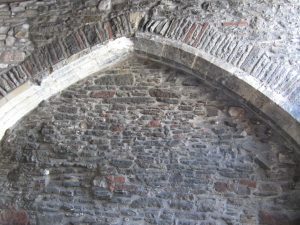 The glass works went through several phases and was closed in 1802. There is also evidence for important pottery works. Any future development must take account of this significant archaeology which is likely to survive over much of the site. Moving on to the site of William Canynge’s house, adjacent to Jessop Court, we saw an image of the arch-braced roof of Canynge’s Hall, that was demolished in 1937 for road widening, as well as the surviving fine two-arch arcade which formed the north side of the hall. In 1913 a tile pavement from the house was sent to the British Museum. 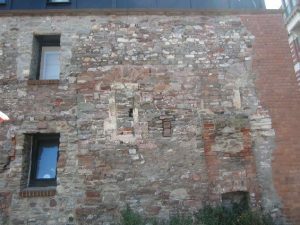 Part of the tower at the west end of Canynge’s House still remains and has been incorporated into the present modern building. 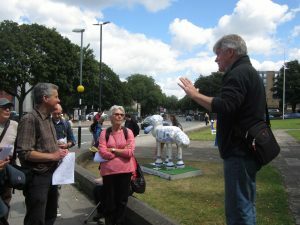 Canynge’s property would have been on the water’s edge and it was explained how residents could enlarge their properties in the medieval period by dumping rubbish and pushing back the river. Canynge’s House probably had a slipway to the river. At Thomas Lane was an area of dyers’ workshops, where the layout of tenements with associated waterlogged madder root and other dye plants was excavated. Also, there was evidence of a furnace with a clay chimney used for metal working. Passing the Seven Stars public house where Thomas Clarkson met for anti-slavery meetings, we stopped at the Wool Hall in St. Thomas Street, where also an earlier market was held. Tucker Street would have been on the river edge and is another area of fullers and dyers. The area was known as Arthur’s Fee and today houses of the late 18th Century line Bath Street which was cut through in the 1780s to create a more direct route between Temple Street and Bristol Bridge . Temple Cross is where Grimes Lane and Hawkins Lane meet . The Law Ditch was found here during excavation, but more importantly perhaps for the origins for Bristol, an earlier ditch was discovered dating to the Late Saxon period. 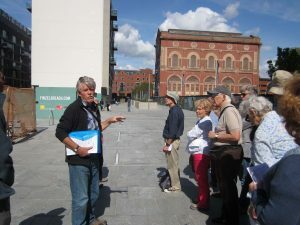 Here was the biggest excavation in Bristol to date that recovered evidence of dyeing, tanning and metal working. This is the area of George’s Brewery that was established in 1788. It was taken over by Courages in 1963. It is in this area that Conrad Finzel had a Sugar House from 1839 at what is now known as Finzel’s Reach. 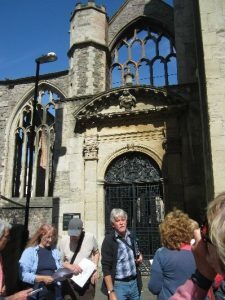 The Knights Templar church was built in the first half of the 12th Century on land given by Robert of Gloucester. This is in Temple Fee. It was originally a circular church. There appears to have been a general rebuilding of the church from the late 13th century. In 1299 Edward I granted land and a chapel, St Katherine’s Chapel, to the company of Weavers. Construction of the tower started in 1441 and was completed by 1460 but had started to lean since its initial construction and was built in stages to try to counteract the problem. The Weavers’ Guild Hall is to the south of the church, possibly part revealed in excavation in the 1970s. 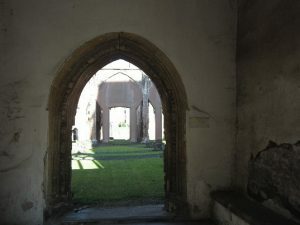 The area to the south of the church was known as the Rack Closes, used for the drying of finished wool cloths, and remained open land until redevelopment from the 18th century onwards. Excavation close by has revealed evidence for the rack bases as well as the hooks, tenterhooks, used for fixing the cloths to the racks. Our final site was the Portwall Lane Glassworks that were in use up to the end of the 18th Century. Here a complete large glass cone and part of a second cone were excavated and the glassworks plan and layout was revealed. We ended at the site of the Law Ditch, which is currently under excavation by Cotswold Archaeology. 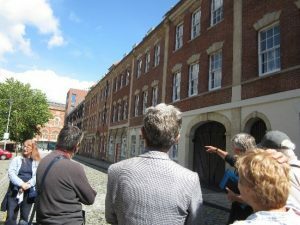 This was a fascinating and illuminating walk around what was an extremely important industrial and commercial area of Bristol. A big thank you to Bob!